March 27, 2012 | Meagan Miller & filed under Uncategorized. This is an exciting time to become involved. The world of broadcasting is transforming, and CJSR is ready to head into the future. We are eager to share our strategic vision with you and discuss the many ways we can benefit from your insights. Serving on our governing/working board is a rewarding experience, and together we can work to realize the vision of FACRA and CJSR. The FACRA Board is a working board that offers both top‐level governance and hands‐on direct service. Board members are expected to be due‐paying members, participate in fundraising activities, serve on 1 committee, attend monthly board meetings, as well as contribute 5 hours to CJSR/FACRA work per month. We cannot overstate the rewards to be found serving as a member of FACRA’s Board of Directors. Your leadership will help CJSR’ continue to fulfill its mandate to enlighten and entertain our audience through high quality and diverse programming that constantly challenges the status quo. Together, as a Board, we will strive to maintain CJSR as a dynamic environment for our fellow volunteers, staff and community supporters. 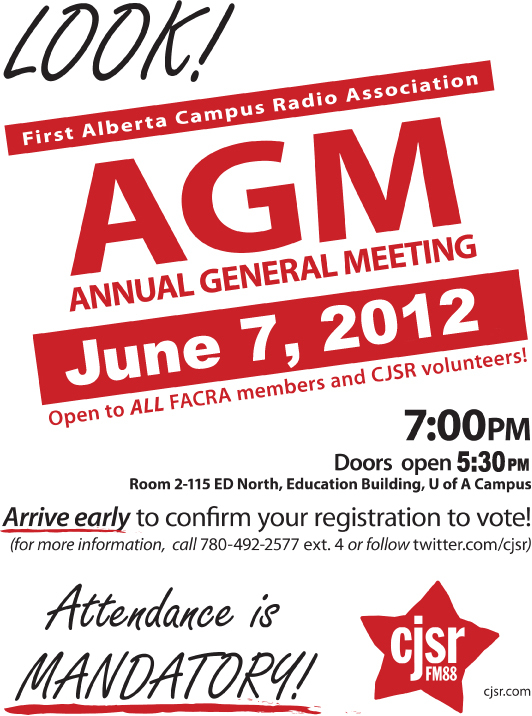 If you are interested in joining the FACRA Board of Directors and are able to meet the expectations listed above, we strongly encourage you to have a look at the nomination package and come out on June 7, 2012 and let yourself be nominated for the FACRA board.